Would you recommend StartupBase to a friend? I tried StartupBase today, before I really didn't know it. Its use is very comfortable and goes fast, I like that, hopefully my release will not take too long, I launched my first project, for now I'm happy. This platform is very useful! thank you Atta ⚡️ I will use it in the future for my next projects. Atta ⚡️Maker@attacomsian · Founder, Wired Dots. @angus_halen @bentossell The idea is not to compete with Product Hunt or BetaList. It's is just an another platform to help the founders to get feedback & to find early users. BetaList features only private beta startups. We only feature startups which are publicly available. Unlike BetaList, we DON'T charge for listing too and will never charge. Product Hunt is a big platform and StartupBase is nothing in front of it. We are different from PH as anyone can feature any product here. We only feature technology startups. Moreover, there is no need of special invitation or special rights on StartupBase. As I said in my first comment, the website is NOT completed yet. Our main focus is to create tools for founders to start prelaunch campaigns to collect early adopters & beta testers emails. @bentossell @angus_halen Thank you for your feedback. My goal is simple. To help early stage founders to find their first users without spending much money. I know it is not easy to build such a platform but I don't feel necessary to charge founders just to meet expenses. There are plenty of other ways to monetize the platform which I am not thinking at the moment. For the design of the website, it is created using Bootstrap 4 from scratch. @bentossell When individuals don't learn they copy, copying skips learning ( coming to similar conclusions with psychology, math and science to solve problems ) and normally their motivations are completely different...I see this all the time with my clients who come to my design firm and their brief begins with "100% pixel copy of say snapchat or facebook or instagram". They have no idea what they are doing, and their motivations are not in any way to provide more value than what those products do in the market...it's much more depressing. What I'm expressing is an actual mathematical law that effects us all and sadly a lot of people are unaware of any of this ( in their team ) and don't care to foster the right culture early on. You have literally ripped off the design of both Product Hunt and Beta List. Pretty shameful. Have some respect. @dylankbuckley I didn't copy resources from anywhere including PH & BetaList. It is true that the design was much inspired from PH. Now, it is changed completely. Hi Product Hunters 🙌 StartupBase is a community of makers and entrepreneurs to share & discuss the latest products and ideas. Our aim is to build a FREE platform where founders can showcase their startups and get productive feedback in return. We also want to help makers to find early users without paying any cost. The website is not completed yet. 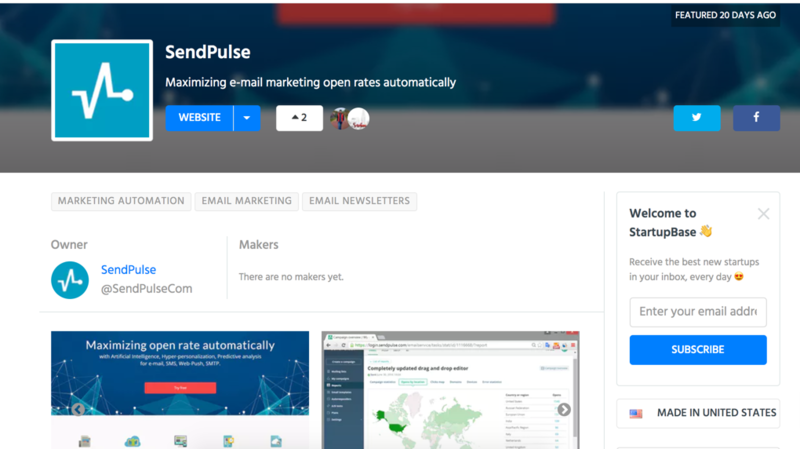 We are still working on adding features for private beta startups to launch their viral campaigns for FREE to collects early adopter emails. You all are always welcome to provide us your valuable feedback. Even we would like to invite you as a moderator for our platform. Help us building a community together. Cheers!! @attacomsian at this specific moment in time your project is just a PH clone, I hope you agree with me on that. Why didn't you start with "adding features for private beta startups to launch their viral campaigns for FREE to collects early adopter emails"? And another question: how did you decide to launch a PH clone on PH? @luigimeclea first of all, it is not a PH clone. Having mere design inspiration does not make it a clone of PH. The idea behind StartupBase is way different than that of PH. I didn't copy anything from PH and I'm not intended to do so. The design, the graphics, the startups listed on StartupBase, all are original. Second, launching at PH was my own choice. If it would have been clone, I never did so. Since the startup world is so much saturated that StartupBase may resembles with many other sites at the moment. You may also want to call it BetaList, Betapage, StartupButton, StartupInspire clone too. But it won't change the goal behind launching StartupBase. @attacomsian ok man, thanks for the answer, best of luck! What are the best platforms to get beta testers for your product? What are the best ways to launch a new product?